Bidspirit auction | Collection of Photographs – "Maccabiah"
42 photographs of "Maccabiah" events and sports teams in Palestine. [Palestine, 1930s (one photograph from the 1950s)]. 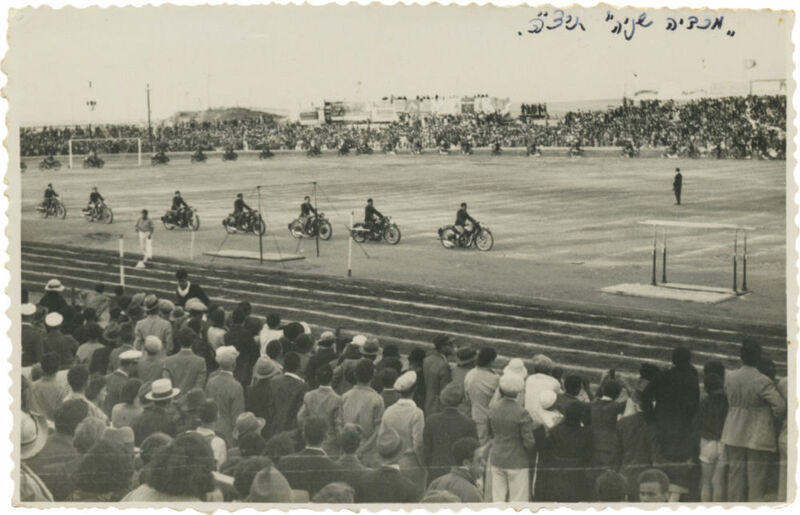 Photographs of "Maccabiah" events and sports teams in Palestine, most of them taken during the first and second "Maccabiah". Among the photographs: • Opening ceremony of the first "Maccabiah", 1932. • High Commissioner Arthur Wauchope walking with Tel-Aviv Mayor Meir Dizengoff at the opening ceremony of the first "Maccabiah". • General exercises at the opening ceremony of the first "Maccabiah". • Photographs of delegations from Germany, Czechoslovakia and England marching at the opening ceremony of the first "Maccabiah". • "Maccabi" Poland team, first prize winner for artistic gymnastics in the first "Maccabiah". • Street posters announcing the second "Maccabiah", 1935. • Opening ceremony of the second "Maccabiah". • General exercises in the opening ceremony of the second "Maccabiah". • Motorcycle riding exercises in the second "Maccabiah". • Poster announcing the third "Maccabiah". • Team of sportsmen wearing "Maccabi" uniforms. • A neighborhood football team, Tel-Aviv. Ink-stamped on the back: "Photo-Lev". • and more. Many of the photographs are titled (mostly on the back), some in print and others by hand. Approx. 8.5X5.5 cm to 14X8.5 cm. Good overall condition. Some creases, stains and blemishes. Some photographs are trimmed at margins.